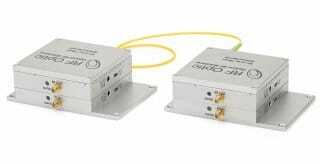 Tel Aviv July 8, 2017 | RFOptic, a leading provider of RF over Fiber (RFoF) and Optical Delay Line (ODL) solutions, announced today that it has launched an innovative compact bidirectional (2 way) RF over Fiber (RFoF) transceiver. The unit is comprised of an uplink of Tx and Rx (at 1550nm) and a downlink of Tx and Rx at 1310nm. The transceiver employs WDM technology to use only 1 fiber link instead of 2. RFOptic is a leading provider of RF over Fiber (RFoF) and Optical Delay Line (ODL) solutions. For the last 20 years, its team of industry veterans has been developing, designing and integrating superior quality technology for a wide range of RFoF and ODL solutions. The solutions are deployed at various industries, including broadcasting, aviation, automotive, and defense. RFOptic offers its customers and OEMs various off-the-shelf products, as well as custom-made solutions optimized for a wide range of RFoF products at affordable prices and with a quick turnaround. RFOptic makes it its mission to help its customers to turn innovation into real business by providing them with the highest quality, cutting edge RFoF solutions as well as customized solutions based on individual requests and objectives.